You've always known your little girl is a princess... Why not let her and her friends feel like royalty for a day with a princess birthday party? The princess party is a timeless favorite filled with beauty and enchantment. Best of all, it's an adaptable theme that can accommodate almost any age, location or number of guests. Whether you're turning your living room into a castle or renting a party room for a royal ball, we have some suggestions to help throw a party sure to make your daughter and her guests' princess dreams come true with princess party invitations. Follow Polka Dot's Princess Party Ideas on Pinterest. Hear ye! Hear Ye! It is time to declare that dreams really do come true. 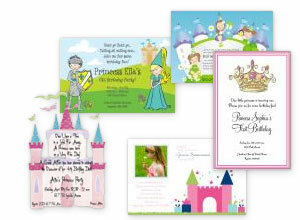 Gather around and let us be your Fairy God Mother and help you pick from our princess invitations. Is your heart is drawn to the princess carriage invitations? You don't have to wish upon a star to create a dream come true for your little princess. There are so many options to choose from. Don't forget the matching princess address labels. You can use them for the invitations and then notes of gratitude after the event. Let us help you create your party with our princess party ideas. 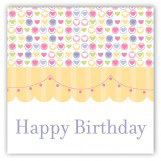 We adore the idea of featuring your very own princess on a princess birthday photo invitation. Just snap a shot of her playing dress up. This probably won't be hard. Like many little girls who just absolutely love anything princess, most seem to attend a Royal Ball several times a day. All you have to do is capture the moment. The Princess Birthday Party is the easiest to plan. The challenge is to make it fun and appealing for both boys and girls. We have got you covered. Focus on the prince and princess silhouettes for an elegant feel. 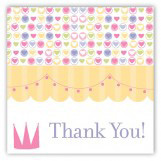 Pink and blue can be used as the main colors, which was a great way to include both the little princes and princesses. Welcome your Royal Guests at the front door by fastening Cinderella and Prince Charming cut outs to it. Having the theme at the door when your guests walk up sets the tone for a spectacular first impression. 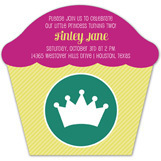 If you are using one of our princess crown invitations, save one to display at the cake table! You can feature a polka dot princess them on the dessert table to keep things playful. The linens on your main dessert table can be styled to mimic the look of Cinderella's dress. Simply drape the table with a soft pale pink fabric and accent the corners with polka dot blue bows. Wonderful accents can include decor from your home, such as a candelabra, pink roses, vintage books, and don't forget the delicious desserts. If you have a chandelier, swag this over the dress up table, it will definitely create the luxe royal look! You can extend the princess theme into all kinds of various princess cookies. A crowd pleasure would be "Frozen" themed donut balls, and Belle's red velvet cake pop roses. The Beauty and the Beast themed cake pops will be scrumptious and memorable. They look incredible and tasted amazing! Don't forget to create a Royal Table. The idea is to have all the guests dine at a royal table, so one long table can be created to achieve the look. Crisp white linens can be used as the base, then add the magic with silver candles and pink roses as a centerpiece. A pink chandelier hung from the ceiling will tie it all together. You can have princess-inspired games and activities like a large inflatable princess carriage for a bounce house. You can create a "Seven Dwarfs" mining station where the kids shift through sand to find gemstones. Jazz up a simple table or rolling rack into a dress up area with princess clothes for the girls and swords and crowns for the boys. You can have face painting and a "Brave" station where the children can throw water balloons at a target. It's all about creating that moment when a little boy feels like the hero and a little girl feels like the princess. What could be more divine?